That’s how Jason Meier, Director of Student Activities, greets new students during orientation at Emerson College in Boston. Students at an increasing number of colleges are challenging traditional personal pronouns and pushing for new preferred gender pronouns. At the University of Vermont, students can have themselves listed as she, he or ze, on class rosters. The university also offers “neutral” as a gender option for students and lets them use whatever first name they want, even if the one picked hasn’t been legally registered. In February 2015 students at Scripps College in Claremont, CA. 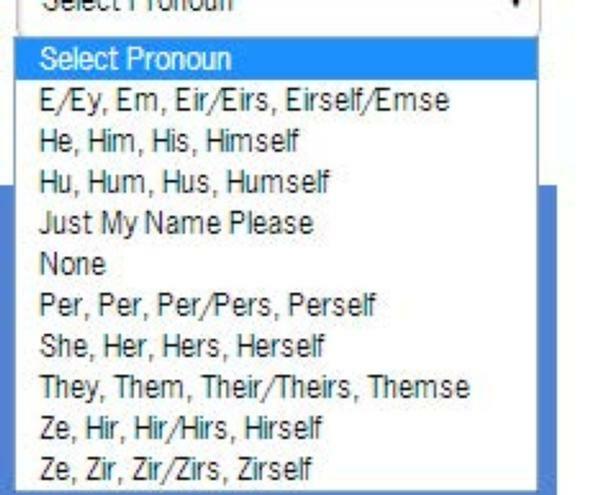 were advised that henceforth they could choose which of numerous different pronouns they wanted professors to use in addressing them. Rachel Neuberg, a sophomore at Scripps, told a student publication, The Student Life, she believed the change was a necessary step for the college to make in creating a safer environment for students. But support for all this is far from universal. Some critics argue that colleges, by capitulating to the demands of student pronoun police, are pandering to the perpetually offended. Other say the whole contretemps is just responding to self-obsessed people who think the world revolves around them and a politically correct, Orwellian effort to validate social progressive doctrines. Critics also charge that academics have failed to do their duty by allowing, and sometimes fomenting, the spread of the pronoun police. . “…the ideology that there is “sexist language” in ordinary words and in the ordinary use of English gender rarely comes under sustained criticism, even in the intellectual arenas where all things are supposed to be open to free inquiry (an ideal asserted with increasingly laughable dishonesty at American universities),” said Diane Ravitch, author of The Language Police. Morton Schapiro, president and professor of economics at Northwestern University, writing about how to deal with free expression controversies on campuses, said, “It might be relevant to remind people that elected student representatives have every right to recommend what they want, just as the administration has every right not to abide by what they suggest…” Perhaps the same principle should apply to the pronouns debate. What should you do? How do you navigate the rocky shoals of the pronoun wars without being chastised, harassed, berated and charged with insensitivity? ‘Tis a puzzlement. This entry was tagged Diane Ravitch, eir, eirs, eirself, em, Emerson College, emse, Hampshire College, hir, hirs, hirself, hu, hum, humself, hus, Morton Schapiro, Northwestern University, per, perself, pronoun police, pronouns, Scripps College, The George Washington University, The Language Police, themse, University of Vermont, ze, zir, zirs, zirself. Bookmark the permalink.